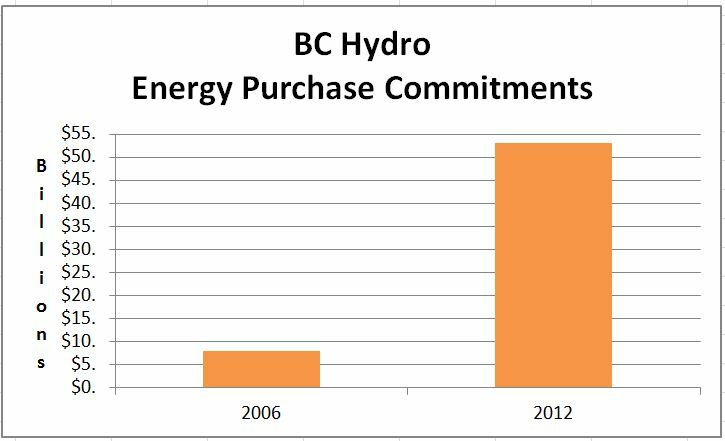 According to audited financial statements, BC Hydro’s debt for future energy purchases was $7.9 BILLION in 2006, not including Powerex. In 2012, that number had gone up almost seven fold, to $53.1 BILLION, not including Powerex. Can anyone direct me to a discussion of this fact anywhere in mainstream media? British Columbians own a per capita share of this debt: $12,055. Hmmm. Six people in my house means our share of the debt: $72,330 including $36,165 belonging to three children six-years of age and under. I'll take a look and get back to you on that Norm. BCH is buying a huge amount of IPP power while BC consumption is actually lower than in 2006. But Hugh, didn't they tell us we needed all those destructive ruin-of-the-river projects to meet growing demands for electricity by energy hungry citizens? As Merv Adey mentioned on the Twitt Machine…You are the mainstream Norm. Yes. And once Hydro rates go up, domestic consumption will go down even more. But BC Hydro can export surplus power to the US. Just maybe not for a profit. Stephen Smart was just going to Air with this story last evening, but it was bumped by Breaking News that Premier Elect Clark's Filopina heart transplant has not gone well. But some will, however see big return on their investment. It just will not be the people of British Columbia who are paying for it all. “… Spilling water results in habitat concerns that are a violation of BPA’s Clean Water Act and Endangered Species Act obligations. For this and other reasons, Bonneville Power Authority has had excess power that BC Hydro could have acquired for next to nothing. Additionally, BCH could have generated additional power on its existing dams with almost zero marginal costs. Instead, we've been stuck with high price power that MUST be purchased from private producers in BC. It is a financial scandal far, far beyond any experienced in British Columbia. Ever. $53 billion for IPP power. ka-ching!! $8 billion for Site C. ka-ching!! $1 billion for the “smart grid” ka-ching!! Norm. as shocking as this is I first read about this over a year ago. Economist Erik Andersen has been warning of this for at least two years now. You can see conversations between him and Rafe on Rafe's 'common sense canadian' site. He is very informative and knowledgeable. Quite right. Erik Andersen has written regularly about Hydro's compromised situation. His work is excellent and I admire and appreciate Common Sense Canadian. However, although Rafe Mair, Damien Gillis and others provide excellent material, their site is not mainstream or corporate media. As a reader commented on another piece, Vaughn Palmer and the Vancouver Sun can't be bothered to bring this issue to the forefront. How much time did Postmedia, Global or Corus spend reporting on David Cobb's exit from the CEO office at BC Hydro. The trigger was political interference and Cobb was unwilling to play their games. The real story is not a secret to insiders and many media people. To report though would be embarrassing to BC Liberals. Of coures you are correct Norm, that is the point I was wishing to make.It simply boggles the mind how lax these people are and how protedted some people are. May I say that despite all of the awareness, projects are still being rubber stamped by the EAO. Perhaps even fastracked due to the looming election. Public knowledge of progress in applications is hindered by insufficient media coverage. I would say “mainstream media” but that no longer applies, they are but “tributary media” now…if that. Like Merv Adey says, Norm is the mainstream now. We can stop them one by one. Submit a comment here to force the EAO to prove they are not rubber stamping applications. It irks me that Carole James took a bunch of reporters up in an airplane to show them the damage and scoop of the ROR power projects and she was ignored. The weather was too windy for them to look out the window and see the damage. Instead of reporting on the damage the IPP's were doing, they ridiculed her for taking them on a bumpy ride. What a bunch of gutless reporters. Now we are getting some pictures and an update of the damage she was pointing out. Just think what would have happened if she was listened to by these useless media types.